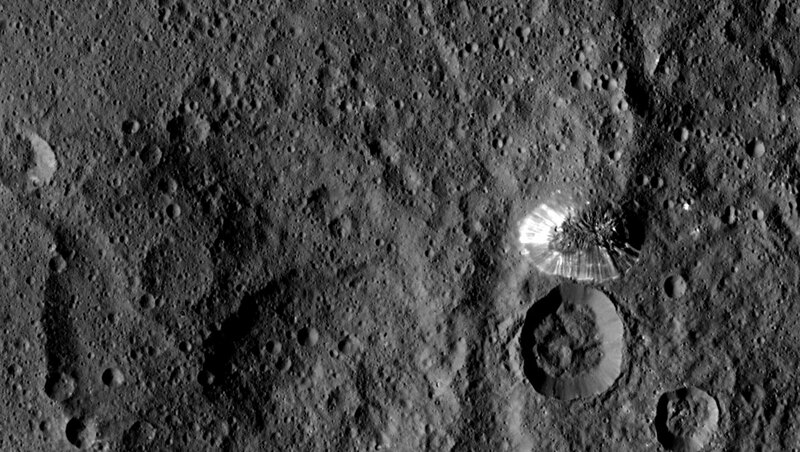 If you were hoping that closer-up photos of Ceres would solve some of the dwarf planet's mysteries... well, you'll have to keep waiting. NASA's Dawn probe has transmitted pictures taken from 915 miles up, and one of them shows an odd, conical mountain jutting out of the landscape. Seriously, it's baffling -- its shiny surface and abrupt angles make it look like it was transplanted on an otherwise soft, cratered surface. There's no explanation for what created it (an ancient collision, perhaps? ), but it's clearer than ever that even a seemingly featureless celestial body can hold its share of surprises.